In the Spring of 1990 at Mt. St. Mary's Seminary in Emmitsburg, Maryland, a seminarian, a rugged Midwestern farm boy, found himself experiencing severe discomfort in his abdomen. He underwent some medical tests and was told by the doctors there that he should withdraw from the seminary because quite likely he only had a few months left to live. The doctors, with their scanning equipment, had discovered an enormous tumor growing inside the seminarian's abdomen. The cancerous mass enveloped most of his intestines, and it was just a matter of time - very short time, before the cancer would break through the intestines and finish him off. The seminarian spent the next day on the phone working out airplane arrangements. He packed his bags and was anointed at community Mass by the rector. At the end of Mass, he spoke a few words. This was a seminarian who was well-liked by his peers, and who always treated others with the greatest respect - and so it was natural that at this point in the Mass, there wasn't a dry eye in the house. The seminarian told his brothers not to mourn his condition, and not to be angry with God over this misfortune, because for some deep reason, this cancer was part of God's plan for him. They should pray that he not lose heart, and certainly they pray for a healing, but they should not see this as anything unfair. With those words he left. Back in the Midwest, the worst fears of the East Coast doctors were verified. Exploratory surgery showed that, while the adjoining organs were free of cancer for the time being, the tumor in his abdomen was of a particularly virulent kind. The doctors gave him a week to recover from the surgery, and then put him onto a severe regime of chemotherapy. Because he was in such excellent shape otherwise, they were able to administer the maximum possible does that would have killed a weaker or an older person. Still the cancer grew. . . The seminarian's bishop now announced that he would ordain him a deacon - right on schedule as the man was in his third year of seminary. The seminarian embarked on his canonical retreat, was ordained, and served his first Mass as deacon. More chemo followed. Six weeks later, after further scans showed that the tumor had gotten even larger, the bishop told the man to prepare for priesthood. Another canonical retreat followed, then came the ordination, then the first Mass. By this point the young man was of course missing all his hair, and was so gaunt that he looked as though he had just gotten out of a concentration camp. The day after his First Mass, he checked into Mayo once again, and was given more scans prior to going back onto chemo. It was here that the doctors saw that the tumor had vanished. In fact there was a golf-ball sized shadow there, which the doctors interpreted as the remains of the tumor - which is what influenced their decision to continue using chemotherapy. After all was said and done, however, five months later, the doctors concluded that this golf-ball sized shadow was really only scar tissue, and that in fact the cancer had vanished on ordination day. The new priest, who as a seminarian, had had significant difficulties with his studies, who had been tempted more than once to leave, and who felt awkwardly shy in front of crowds, now found that he was in demand as a speaker. It's now fourteen years later. He's a successful and well-loved pastor. He is still in demand - from people who want to see first-hand evidence that God is alive and that he is still at work in the lives of his people. This very lengthy anecdote serves as powerful evidence of the wisdom of today's second reading from the Letter to the Hebrews, where the author specifically addresses the fact that things do not always go our way - that life all too frequently includes pain and severe discomfort. But what is to be our attitude? How are we to "deal" with it? The author says that whenever the Lord disciplines us, whenever he "scourges" us - a strong word indeed - that there are greater things at stake than the momentary physical or emotional pain. The first thing to realize when we experience suffering is that it is not God who sent suffering into the world. He is not like a god of the ancient Greeks - someone who gets personal pleasure out of messing up people's lives - out of placing them in bad situations and then watching to see how they'll get themselves out of it. For the Catholic, things are quite the contrary: our faith tells us that our God, the Father of our Lord Jesus Christ, is the very personification of love. Pain and suffering exist because the Original Sin of our first parents has disordered the universe in which we live and introduced sickness and death into the human condition. Our bodies are fragile. Sooner or later they break down - in small ways - or in spectacularly big ways. So if pain and suffering are always imperfections, and if God did not will that pain and suffering be a part of the human condition, and if we have our First Parents to "thank" for this miserable state of affairs, what can we say about the meaning of pain? Can it have a "usefulness" when properly embraced? Does it point to something beyond itself? While thick books have been written on this subject, let's just fasten on three or four potential meanings. First of all, pain forces us to move beyond ourselves and look outward towards seeking help from others - a great lesson in humility. Suffering also forces us to look beyond our own sense of self-sufficiency. It reminds us that we are NOT these little autonomous beings floating around in space. We really do need others - for comfort in our suffering - and, in cases of physical illness, for the expertise that medical people can provide. Most importantly, pain reminds us that we are in need of God - because it is in God that ultimately our consolation will reside. Second, suffering is also a necessary part of learning to love. Autonomous beings cannot love. They have nothing to offer to other people and they have nothing to gain because autonomous people think they have all the answers. Suffering is a reminder that the reverse is true - that we all have a need to embrace others and to be embraced in turn. Third, suffering, when properly accepted, also serves as a reminder that our lives are not our own, that we will one day have to surrender them to the God who gave them to us in the first place. Suffering - in small and in large things - can be a preparation for a grace-filled death. As my spiritual director likes to remind me, "Pain is God's megaphone. He reminds us that He's in charge because we realize that only He can give us true relief. There is no better teacher than suffering, for it is in suffering that Christ Himself teaches us love." Fourth, pain, of whatever sort, also invites us to reflect on the fact that there is a commonality to suffering - that this is something which afflicts every member of the human race. "Misery loves company" as the old saying goes, and on a level of pure psychology, suffering can lead to a certain sense of connectedness with others in the same predicament. On the level of Faith, suffering helps integrate us into the Mystical Body of Christ - whose Head suffered and died for the sins of us all - whose redemptive suffering gives our own aches and pains and disappointments a communal value far beyond the limitations of our personal lives. It is this willingness to pattern ourselves on Christ in all things - Christ who was a Man for others - that will determine whether or not we are one day incorporated into the heavenly city which our other two readings today foretell. 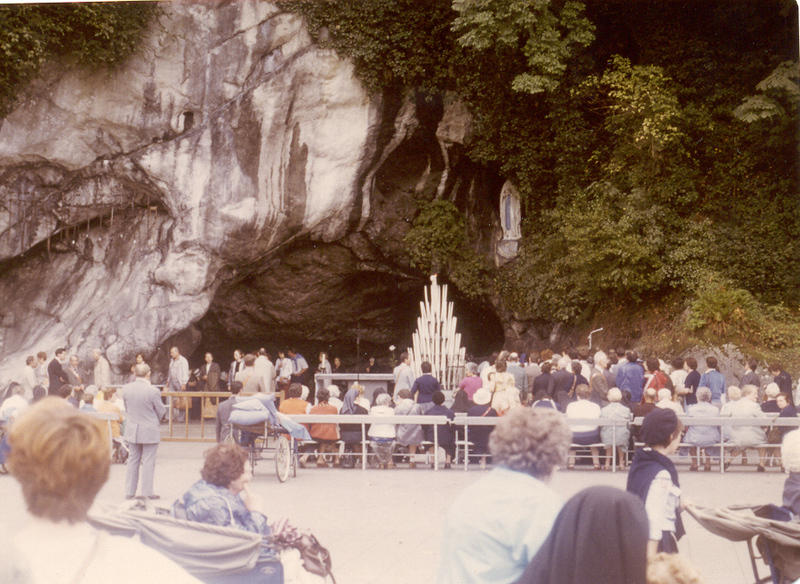 It is said by long-time volunteers at Lourdes that all the sick people who come to Lourdes - if they are open to divine grace - that all these people will experience a miracle. It's not necessarily the miracle they went there looking to find, but it's a miracle just the same: the "miracle of the heart." It involves a sick person's realization that there are people who are worse off. . .that there are people who are in greater need of a physical miracle - and so the sick person starts to feel a greater sense of solidarity with his brothers and sisters than maybe had been the case for years. The sick person starts to pray less for themselves, and more for those other people. The sick person once more feels truly a part of the human family - and thanks to the reality of the Mystical Body, he or she can offer up personal sufferings for the good of someone who happens to be in greater need of divine grace. For such people, personal inescapable suffering, can be turned into a tool for good. Whatever our own personal crosses - whether they be emotional or physical, whatever might be our sense of personal insufficiency - whatever gives us anguish and grief - let us resolve to try as best as we can through prayer to see that God wants to strengthen us rather than hurt us, and let us see in our own sorrows an opportunity for joining ourselves to the Lord Jesus, who suffered and died, so that others might have life.